A nonprofit that undertakes the task of change is making a serious commitment to its improvement, development, and perhaps even longevity and survival. 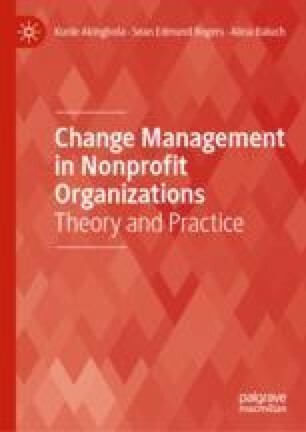 For this reason, it is prudent for organization leaders to methodically assess the efficacy of change efforts and determine the extent to which they have enabled the achievement of organizational goals. This process—evaluation—asks whether a change effort worked the way it was intended to work, and whether it had the intended effect. It also asks how and why things turned out the way they did. In this chapter, we begin with a brief coverage of the history and evolution of evaluation, the purposes of evaluation, who does evaluation, and the various kinds of evaluation that can be conducted. Then we present some common as well as contemporary evaluation approaches, models, and taxonomies, including the familiar and classic Kirkpatrick Four-Level Evaluation Model. Finally, we discuss the nuts and bolts of conducting high-quality evaluation, including designing evaluation, collecting evaluation data, analyzing evaluation data, communicating evaluation results to relevant stakeholders, and evaluating the evaluation process. Astramovich, R. L. (2011). Needs Assessment: A Key Evaluation Tool for Professional Counselors. Retrieved September 22, 2018 from https://www.counseling.org/resources/library/VISTAS/2011-V-Online/Article_41.pdf. Robert Wood Johnson Foundation. Qualitative Research Guidelines Project. Retrieved October 1, 2018 from http://www.qualres.org/HomeObse-3594.html.